1985 - Exhibition title: Montréal plaque tournante de la traite des fourroures. Curators: Jean Deblois, Archives nationales du Quebec, Quebec City, Quebec; 1985.05.17 - 1985.09.02. 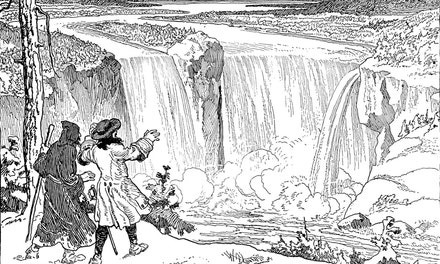 Throughout the earlier history of Canada a Sea of the West lured the explorers to discovery. To seek it many men spent their lives in toils and privations; they ruined themselves, and some perished in the search. They all failed; but out of their failures came the knowledge of the vast interior of the Continent. Among these magnificent failures none was greater than that of La Verendrye and his sons. Pierre Gaultier de La Verendrye was born at Three Rivers in 1685. He was one of a family of ten children of the Governor of the district. Pierre was only twelve years old when he joined the colonial troops and before he was twenty he had seen hard service. In 1707 he joined the French army fighting in Flanders against the great Duke of Marlborough. In the bloody battle of Malplaquet he received nine wounds and was taken prisoner. He was exchanged; but he had no private fortune and no influential friends at court, and without these, promotion in the army was impossible. He returned to Canada and soon retired from military life. Shortly after his return from the wars, he married. Four sons were born to him, and his growing family made it necessary for him to seek some profitable employment. He established a trading post on the St. Maurice River near his native town, which was then an important centre of the fur trade. Here he spent several years, gaining valuable experience, if not much wealth. In 1726 he was given the command of the frontier post of Lake Nipigon, north of Lake Superior, on the verge of the distant unknown wilderness of the West. At Nipigon, while busy with his duties as an Indian trader, he was ever on the alert for information about the regions beyond. One of the Indians drew a rough map of the route which he declared that he had followed to where the waters ebbed and flowed. La Verendrye was convinced that much of the story was probable. He resolved to try to find that Western Sea himself, and so, taking with him Ochagah's map, he travelled down to Montreal in 1730 to persuade the Governor to support his project. The Governor, Beauharnois, was interested; but all that La Verendrye was able to get was the monopoly of the western fur trade, on condition that at the same time he carried on the search for the way to the sea. He was allowed to build forts and to trade with the Indians, and out of his profits he was expected to pay all the costs of his expeditions. He had little money of his own: he needed men and provisions, canoes and trading goods, and he was compelled to ask help from the merchants of Montreal. They were not interested in his plans for exploration, but by promising them a large share of the profits of his trade, he persuaded them to advance the money and goods he needed. 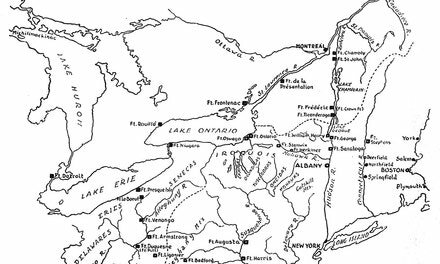 Early in June, 1731, La Verendrye set out from Montreal, taking with him his nephew, La Jemeraye, and three of his sons, boys of eighteen, seventeen and sixteen years, who had grown up in their trading post home at Three Rivers. Late in August they reached the western end of Lake Superior. Gradually during the next few years a chain of trading posts was established from Lake Superior to Lake Winnipeg and beyond as far as the Assiniboine River. A large trade was opened up, for the Indians were glad to bring their furs to the nearby French forts instead of having to take them to the far northern posts of the Hudson's Bay Company. Heavy troubles fell upon La Verendrye in 1736. His most experienced and reliable lieutenant, La Jemeraye, died, and his eldest son and a Jesuit priest, with a party of his men, were all massacred by a band of Sioux Indians on an island in the Lake of the Woods. The bulk of the profits of the trade went to the Montreal merchants, and La Verendrye was deeply in debt. The King complained that he was not doing enough exploration. His partners clamoured for more profits, and rival merchants tried to influence the government to take away his monopoly. La Verendrye had to go to Montreal and Quebec to protect his interests, and it was only with great difficulty that he was able to get the merchants and the government to continue their support. Again he set out for the West. His youngest son, who had been taught to make maps and plans, now joined his father in the family enterprise. La Verendrye had heard accounts of a tribe of Indians called the Mandans, who were said to live on the banks of a great river that flowed into the ocean. 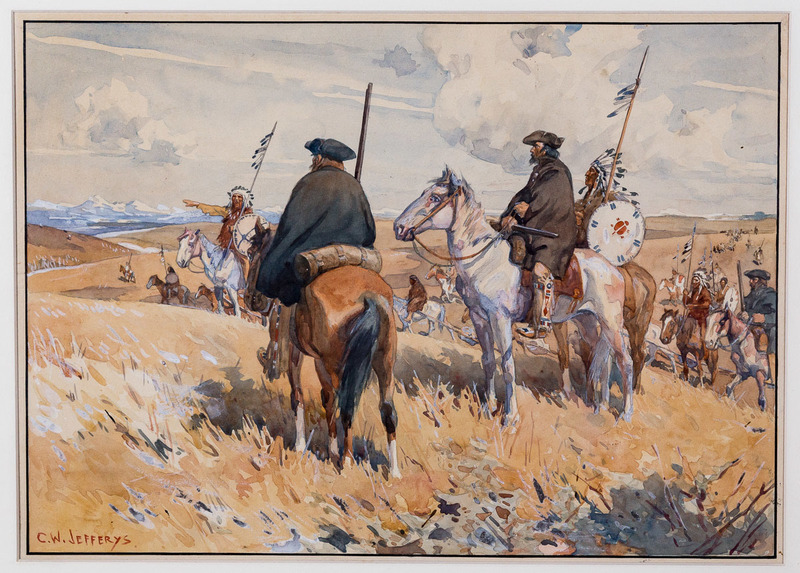 In the summer of 1738, with two of his sons, he journeyed across the plains southwest to their country. He found them on the Missouri River, in villages of houses built of logs and earth; but their river flowed south and not west. He left two of his men with them to learn their language and gain further information, and returned to Fort La Reine, suffering severely from violent illness, caused probably by his years of privation and anxiety. Next year his men returned with news that a number of strange Indians had arrived to trade in the Mandan villages. They rode on horses , and came from the west, where they said there were bearded white men living in stone houses on the shores of a lake whose waters rose and fell. These white men must have been Spaniards of Mexico and California. Their story was true, but it gave no idea of the great distance that had to be travelled to reach the Pacific Ocean. Meanwhile, La Verendrye sought other routes. One of his sons explored the Saskatchewan as far as the forks, and built a post at the place now known as The Pas, on the line of the present Hudson Bay Railway, but lack of means prevented further progress in that direction. 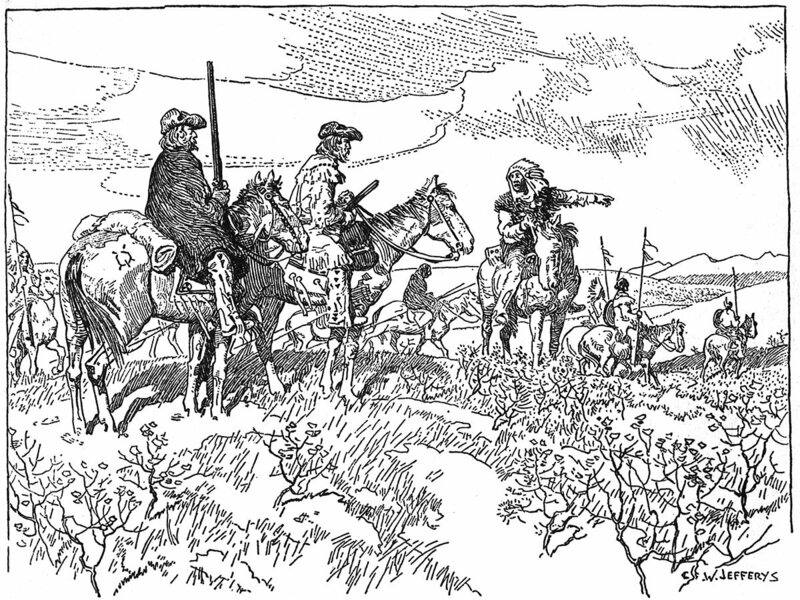 In April 1742, two of La Verendrye's sons, with two other Frenchmen, set forth again to the Mandan country. Their father stayed behind, for he was too ill to travel, and the business of fur trading must still go on. The sons reached the villages and waited there for the expected visit of the Horse Indians. As they did not come, the brothers started, near the end of July, with two Mandans to guide them to the Horse Indian country. They crossed the Missouri and travelled for twenty days through what were later known as the Bad Lands. When at last they reached the Horse Indians they admitted that they had never been to the Western Sea, and said that the way there led through the country of the fierce Snake Indians, the terror of the western plains. A neighbouring tribe, the Bow Indians, might be able to take them to the Sea, and were the only tribe able to fight the Snakes. To the Bow Indians, therefore, the brothers travelled, and at length found them in a huge camp, preparing to start out to attack the Snakes. Over two thousand warriors with their families were gathered, the prairie was covered with hundreds of teepees, and La Verendrye's account tells us that the Indians had with them great numbers of horses, asses and mules. This information is of great interest, since it shows us how far north the horse had reached at this date. The Spaniards had brought the first horses to this continent, and from their settlements, from time to time, horses escaped, or were purchased or stolen by the Indians. The possession of these animals made an entire change in the life of the Indians, and gave the tribes who used them an enormous advantage in hunting, in travel and in warfare. With these mounted Bow Indians the brothers journeyed in December on the westward warpath against the Snakes. Though it was winter, it was comparatively mild in that region and the snow was light on the prairie uplands. On New Year's Day, 1743, the snowclad tops of distant mountains came in sight to the west. For eight days the war party journeyed toward the mountains. As they were nearing the enemy's country, the women and children were left in an encampment with a small guard, while the warriors pushed on. One of the brothers went with them, while the elder remained with their baggage. Four days later the scouts found an abandoned camp of the Snakes. Their enemies had fled hastily on their approach, but the Bows feared that the Snakes had circled round behind them to attack the encampment of their women and children. A panic seized them and they retreated in haste and disorder. The shame-faced warriors found the camp secure; but the expedition against the Snakes was given up, and the Bows began their homeward march. The Frenchmen had to turn back. Once more the attempt to find the Western Sea had failed; but the young La Verendrye had gone farther in its search than any other man. 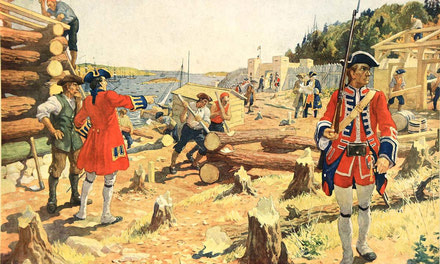 The brothers parted from the Bows and started on their return to Fort La Reine. They reached the Missouri again, and La Verendrye buried on its high bank a tablet of lead bearing the arms of France and the names of the King, the Governor and himself. In March, 1913, a school girl found it in the river bank opposite the present city of Pierre, North Dakota. 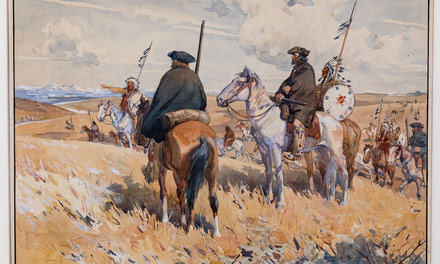 They reached Fort La Reine, to-day Portage La Prairie, where their father anxiously awaited them, in July, 1743, after an absence of almost fifteen months. La Verendrye and his sons had not found the Western Sea, but they had opened up to French trade a vast new territory. The merchants of Montreal who had backed the enterprise had taken whatever profits were earned; but La Verendrye was poorer than ever. He returned to Montreal and another officer was put in charge of the western posts. The new man did nothing towards exploration, and the Governor restored La Verendrye to his command. Some recompense was given him: two of his sons were made ensigns in the colonial troops: he himself was promoted to the rank of captain, and was awarded the Cross of St. Louis, the coveted military distinction of his day. He lived only a few months to carry the honour. In 1749 death took him in the midst of preparations to start on a new search by way of the Saskatchewan. His sons expected to be allowed to carry on his work. But rival claimants got the ear of the Governor, and others were given the western trade which they had established. They continued to serve as junior officers in the colony troops until the end of the French rule in Canada. 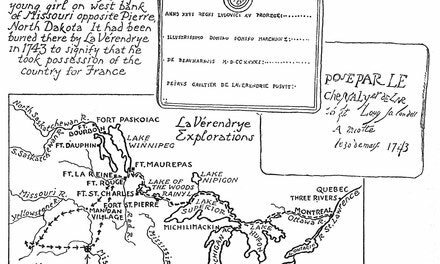 Though descendants of the elder La Verendrye's brothers and sisters are living to-day in Quebec, of his own family none is known to exist. He and his sons live only in the story of a great purpose followed with steadfast courage and devotion. La Verendrye tells us that the Indians near the Missouri had large numbers of horses, mules and asses. This information is of great interest, since it shows us how far north the horse had reached at this date. The Spaniards had brought the first horses to this continent, and from their settlements in Mexico and California, from time to time, horses escaped, or were purchased or stolen by the Indians. They passed from tribe to tribe by capture or trade. The possession of these animals made an entire change in the life of the Indians, and gave the tribes who used them an enormous advantage in hunting, in travel and in warfare. The buffalo, on which they depended for their food, clothing and shelter, now could be surrounded, or ridden down by hunters on horseback. Formerly all journeys were made on foot; the dog was their only beast of burden, and these could carry only small loads. Now they could travel rapidly, and heavy loads could be transported easily by means of the travois. The Indians never developed the wheel.